The temptation of going home - at the peak of the vacation, without prior ticket booking! None of the regular operators had tickets, and the few available tickets on online booking portals were being sold for astronomical rates. I thought of checking our good ol' Kerala SRTC Garuda Volvo - it had lots of tickets! Not thinking further, I booked one for me. I was to travel by Garuda after a lot of time now! I normally prefer seats on the right side, but had to book one on the left side this time. The ticket worked out to a few rupees below Rs. 1000. The odd system followed by KeSRTC means I had to pay for an end-to-end ticket! Around 6pm - I search on the KeSRTC website to get the phone number of the conductor working the schedule. I call up the first number, and I get an "Out of network" message in Tamil. So that confirms that I had to call the other number. I call that number and hear an evergreen malayalam song as the caller tune - the person at the other end picks up the call, with the characteristic "Hello! KSRTC!" salutation. I ask him the current location of the bus, and he replies that they are past Alappuzha. He puts the ETA at Thrissur to be 2200hrs. Left home at around 2045hrs, with my brother. He dropped me outside the KSRTC bus station at around 2130hrs. The bus station was packed to the core - typical of a Sunday night. KaSRTC buses to Bangalore were rolling in one after the other. I made a casual enquiry at the enquiry counter to have an update - the officer sitting there replied "It is scheduled at 2045, will come now". I was laughing within, since the official departure time is 2205hrs!! I spent some time enjoying the new KeSRTC Leylands. At around 2200hrs, an announcement was made on the PA system that the "Garuda AC Volvo to Bangalore via Coimbatore, Salem, Hosur will arrive shortly". In the mean time, the KaSRTC Airavat Club Class, working Kottayam-Bangalore rolled in. Being a Sunday, all the buses to Bangalore were packed to the core. 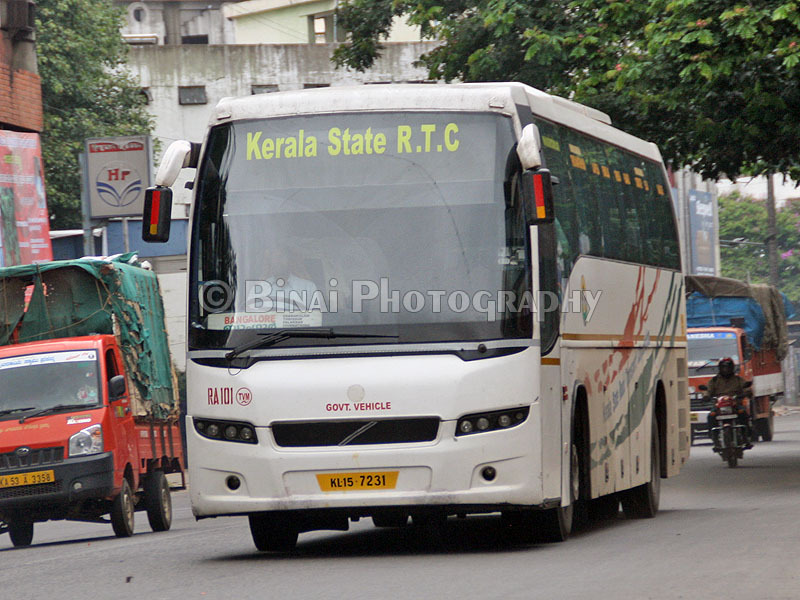 The Bus: RA101, KL-15-7231 from Trivandrum Depot. Photo from archives. The old lady from Trivandrum depot rolled in at 2223hrs - it was RA101. I was thrilled to see this bus - the star of the series. I literally touched the bus and walked around it before I got in. The bus still looked well maintained - the paint colour was dull, but was still in good shape. The conductor checked tickets as passengers got in itself. The conductor then went to get his waybill signed, and finally the bus rolled out of the bus station at 2233hrs - 23 minutes late, not at all bad for a bus that has run over 250kms from origin. The interiors looked in fairly good shape - the AC was chilling. I was carrying a bed-sheet with me. The driving was not very confidence inspiring - he threw the bus around as we ran through Thrissur Round, turned towards Patturaikkal, and got onto Shoranur road. The driver had no mercy to passengers as he picked up speed and started a very rash run towards Shoranur. He never bothered reducing speeds at curves or potholes. I couldn't sleep at all, since the bus was swaying badly all the time. We pulled into Palakkad bus station at 2345hrs. The bus went straight to the fuel station - the engine was left on. After refueling, we started off at 2352hrs. I guess the drivers changed at Palakkad, since the driving was sane after Palakkad. I slept off after Palakkad. We did not enter Coimbatore town - I remember the bus passing one of the toll gates on the bypass. I had an amazing sleep after Coimbatore bypass. I do not remember the bus stopping for a break anywhere - I did keep waking up in between - I'm now spoilt traveling in semi-sleeper seats - the non-semi-sleeper seats are now a pain, and I feel very uncomfortable on them. I woke up just as the bus was running past Hosur (0546hrs) - I was groggy, but did not want to continue sleeping for the fear of missing my stop. We stopped at the Electronic City toll at 0607hrs (a couple of passengers got off) and then we took the BETL. I do not get the reason why buses should take BETL this early in the morning - you really don't save any time - just pay money. I headed to the cabin as we passed Singasandra. I was happy seeing an old-timer at the wheels - had a short chat with him - he was elated when somebody identified him to be an old-timer. This particular driver was very skilled - he maintained good speeds, but did not give that dragging feeling. His overtaking maneuvers were excellent as well. I requested him to drop me at the end of the bridge, instead of Silk Board - he accepted my request,and stopped immediately after getting off the bridge (0615hrs) - I thanked the crew as I got off. Then walked down to Bommanahalli, and took an auto home, without having to haggle over the rates! End Notes: The bus, KL-15-7231 (RA101) of Trivandrum depot had clocked about 8.7 lakh kms. This bus was delivered in December 2008 - its almost 5 years since. The bus is almost at the end of its life-cycle (Kerala MVD allows only 5 years for such buses). I am sure this would be my last trip on that bus - in fact, my first ever KeSRTC trip was in the very same bus (read here). The maintenance was above average - not much rattles, but the AC did make a lot of noise, and the grille was vibrating all the time. The interiors were clean - the curtains looked very fresh. The crew were well-dressed and well-behaved. The conductor answered very politely when I called him, and they were accommodating of passenger requests. The first driver was scary - the second guy was really skilled. The end-to-end run took 7h42m - quite fast for a bus which entered Thrissur town, and took the twisty Shoranur route. The ride was not really sleep friendly (especially the first driver), but the service was crisp. 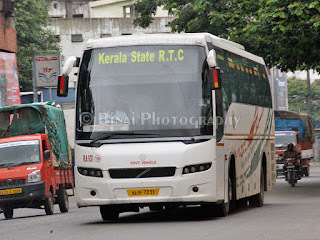 I really hope KeSRTC gets more Volvos and uses them to restart all their old AC routes. They have the capability of running a good service - just not capitalising on them. Will I take this service again? I wish they get new buses. I am always game for a KeSRTC ride. the old timer must be one Mr Shaji, maybe close to 50 years or so..very good driving, responsible and safe. A few of the other orginal crew have moved back to other services recently. A very nostalgic review..Garuda always has a special place.. I traveled in the very same bus this Saturday up till Thrissur from TVM... Rain and Block caused much delays. On top of that the RHS wiper started overrunning outside the glass, when we got past Ulloor. The conductor called up TVM office and get a repair for the same arranged at Attingal. He was adamant that all passengers are going to remain on board while the bus is within the garage, as otherwise it would be very difficult for the long distance premium passengers to stay in the rain... He managed to get that permission while we reached Attingal. Man, it took 75 minutes to remove the malfunctioning wiper, and fit the LHS wiper into the RH side. Hopefully we will see Multi axle volvos replacing the current Volvo and deluxe services... Who knows? God Knows! !